The Cambridge Dictionary of Linguistics provides concise and clear definitions of all the terms any undergraduate or graduate student is likely to encounter in the study of linguistics and English language or in other degrees involving linguistics, such as modern languages, media studies and translation. 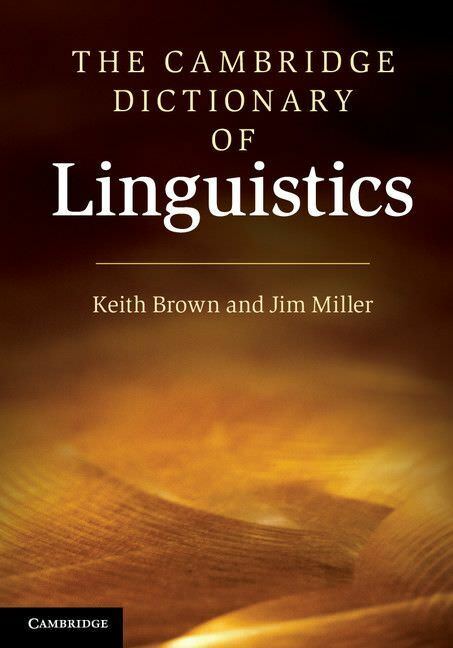 lt covers the key areas of syntax, morphology, phonology, phonetics, semantics and pragmatics but also contains terms from discourse analysis, stylistics, historical linguistics, sociolinguistics, psycholinguistics, computational linguistics and corpus linguistics. It provides entries for 246 languages, including 'major' languages and languages regularly mentioned in research papers and textbooks. Features include cross-referencing between entries and extended entries on some terms. Where appropriate, entries contain illustrative examples from English and other languages and many provide etymologies bringing out the metaphors lying behind the technical terms. Also available is an electronic version of the dictionary which includes 'clickable' cross-referencing. Last edited by deutsch3000; 05-30-2018 at 03:24 PM.